Those who came to the recent NOI neuroscience festival in Adelaide will have noted more education and research devoted to Graded Motor Imagery. The Graded Motor Imagery Handbook is now available. Due to popular demand, the next two NOI Notes are devoted to the topic of Graded Motor Imagery from the clinical viewpoint. Lorimer and I have always been very wary of clinical implementations of GMI. We used to call it embryonic for years. It is increasingly becoming popular and we want it to be done as best as you can. This means using clinical reasoning to tailor it for individual patients (no recipe books here! ), linking it to education, making it a part of a package that deals where possible with all relevant contributing issues to a person’s problem and being prepared to grade, adapt and move along the scale of therapies in GMI (see Figure 1 below from The Graded Motor Imagery Handbook which shows where GMI ‘sits’ in overall management). It’s no magic cure – it’s hard work in a patient group with problems that, in many cases, are harder to treat than some cancers. Part of the growing up process of a proposed treatment strategy is to see what pain states may benefit and to keep an eye on what is happening in basic sciences. While the relevance of Graded Motor Imagery in neuropathic pain states such as CRPS is supported, what about other pain states, including some that may be “not so neuropathic”? How scientific is that categorisation!!! But the clinicians will know what I am referring to. Post ankle fracture stiffness – is it all in the ankle? A friend of mine asked me to see her husband. He had fractured/dislocated his left ankle 5 weeks previous. The ankle had been internally fixated and he had been given a moonboot and told not to weight-bear. Little information was provided post-surgery and he had the moonboot on all day and night, even the same post-surgical dressings. He said the ankle was going red – it was super stiff and with a history of RA. He was very concerned about the future. Notably, he said “he didn’t like the foot, especially with screws in it?” and “it didn’t feel like his”. The ankle was very stiff but my original fears of CRPS were quickly dispelled. This of course is basic rehabilitation – start weight-bearing, graduated stretching and strengthening, balance and education. 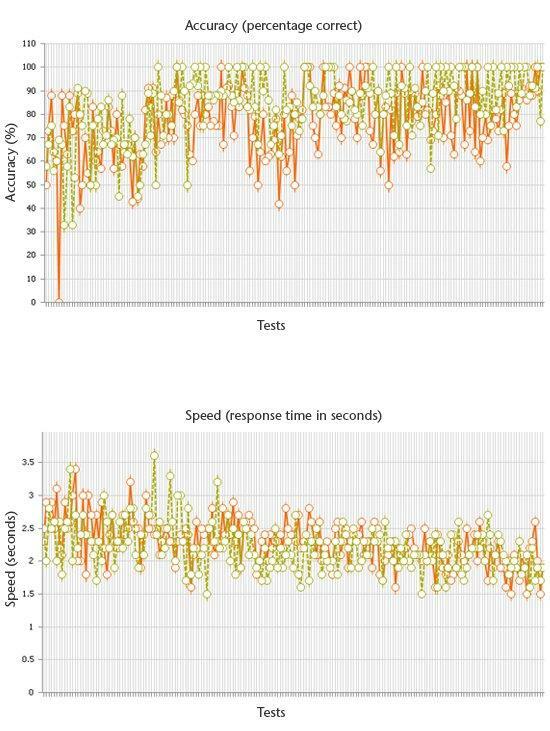 But I also tested the speed and accuracy of left/right foot discrimination via Recognise. Anybody can sign up for a free 5 login trial account to test left/right discrimination at http://noigroup.com/recognise/createaccount. 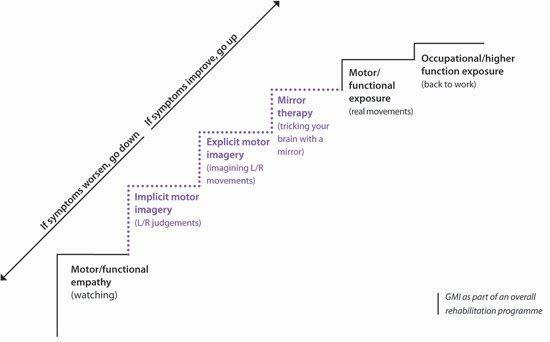 Is there a place for exercise of neurosignatures of immobilised parts? Could it offer some protection against CRPS? Are clues such as “my foot doesn’t feel like mine” indicative of changes of representation in the brain? As you can see the general accuracy improved but still there was far more 100% results compared with the left foot and there was a general decrease in speed of recognition. The speed results at the end of 6 days are regarded as normal. I took something else from the clinical encounter. My friend who is very perceptive said to me as I left after the second visit “you just got him to love his foot again didn’t you?” Well, love wasn’t something I had planned with his foot (still in its original dressing) but I reflected on what was essentially a basic treatment focussing on an unloved body part with its laterality not quite discriminated in the brain suggesting foot representational changes in the brain. I can go with the notion of ‘loving the foot’ as a broad direction to reintegrate/restore brain representation of the part. The integrative activity of multiple sensory inputs such as vision, motor, touch and proprioception plus the ‘welcoming back’ emotions and cognitions would seem enough to activate micro and macroglia keeping an eye on and re-embellishing the synapses which truly belong to the best functioning foot for that person. Mind you, the neuroscientists don’t quite say this directly (yet) but you feel as though they are itching to! Check out one of a number of reviews on the immune system and plasticity. We enjoy and learn from feedback about graded motor imagery. We call it ‘learning from the shadows' – contact us at recognise@noigroup.com if you’ve had similar findings with Recognise testing. The online Recognise software is free for anybody to use as a trial for 5 logins, so give it a go in a pain state. If you get these Notes you’re already a member so use your Noigroup membership email and password to sign in at http://www.noigroup.com/recognise or to set up a new account, go to http://www.noigroup.com/recognise/createaccount. 1. Moseley, G.L., et al., The Graded Motor Imagery Handbook 2012, Adelaide: Noigroup. 2. Moseley, G.L., Graded motor imagery for pathologic pain. Neurology, 2006. 67: p. 1-6. 3. Yirmiya, R. and T. Goshen, Immune modulation of learning, memory, neural plasticity and neurogenesis Brain, behaviour and immunity, 2011. 25: p. 181-213. Here is a brilliant article by Jonah Lehrer, published in The New Yorker in 2010, about The Decline Effect. Download the bite sized recipe book from our last edition, Brain Food. Congratulations to Ewa from Australia for your delicious, simple, fresh and healthy grilled piece of oily fish. In keeping with the NOI philosophy, we loved the adaptability of the ‘recipe’ as much as the healthy ingredients suggested. You now have a copy of Explain Pain and a box of Haighs dark chocolate coming your way in the post. …A grilled piece of an oily fish such as salmon or tuna, a side of fresh green salad (preferably straight out of the garden), dressed with parsley, raspberries and avocado dressed with a good cold pressed olive oil and balsamic vinaigrette on top, with a side of some whole grain such as brown rice/quinoa/barley for the hungry person, this could have some very lightly toasted slithered almonds and walnuts mixed through with a light drizzle of olive oil again. You can also follow this newsletter on the NOI notes archive, and update your profile by logging in to http://www.noigroup.com to keep in touch. This entry was posted on June 6, 2012 at 6:04 am and is filed under 2012. You can follow any responses to this entry through the RSS 2.0 feed. You can leave a response, or trackback from your own site.